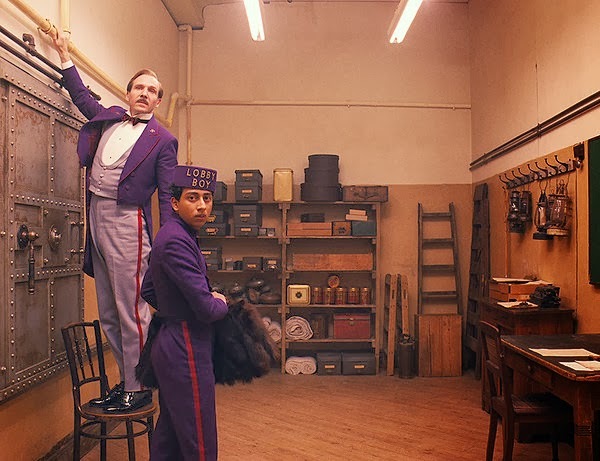 I haven't been particularly inspired by recent cinema releases, which has left me with a bit of catching up to do in terms of viewing, but Wes Anderson's The Grand Budapest Hotel is certainly good enough to get me writing. Anderson's idiosyncratic style is a bit hit-and-miss with me, ranging from the underrated The Life Aquatic With Steve Zissou, to the mealy and vastly overrated Fantastic Mr. Fox. But either way, there's no other director making films quite like his. In storytelling terms, this one is built like a Russian doll, telling a story within a story within a story, across multiple decades. 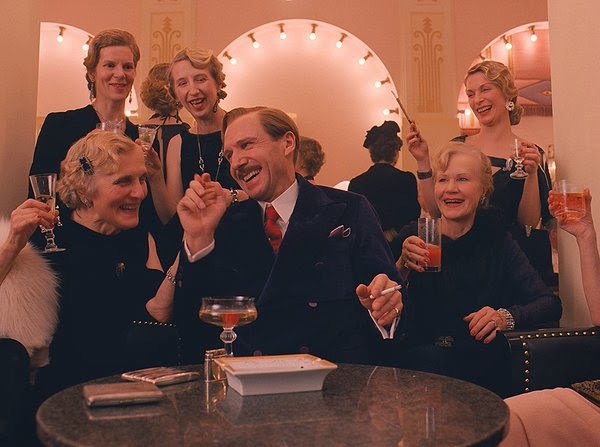 In the (fictional) Eastern European republic of Zubrowka, an old man called Zero Moustafa tells the story of the run-down Grand Budapest Hotel. It was once an institution, back when Zero first became a lobby boy, under the tutelage of the sophisticated hotel manager Gustave H. When the hotelier is falsely accused of murder in a feud over a valuable painting, Gustave and Zero go on an adventure to clear his name and try to save their own necks in the process. Anderson has something of an affinity for the tableau in his films- everything from his framing to the way that his camera pans alongside a moving character or element shows an almost aloof curiosity about the un-reality that he depicts. "Grand" is the operative word in the title, because this is the first time he has brought his style to such a wide canvas, in both a temporal and geographical sense. The film is shot in three different aspect ratios, (and principally in 1.375:1 Academy ratio) to correspond with the prevailing style of each time period, and the familiar doll house style expands to at least the scope of a large model village. This actually has the effect of further immersing the viewer in the weird and wacky world of the story, and this is perhaps the most immersive film Anderson has yet made. I often find myself disoriented after seeing his films in the cinema, because the foyer doesn't look symmetrical and everything looks and feels a bit real, and this time around, that felt even more potent than before. Like many of the director's films, it looks gorgeous, and it couldn't belong to anyone other than Anderson. Still, if it were anyone's film other than his, it would be Ralph Fiennes'. In the role of Gustave H, he shows off a lightness of touch that none of us could have reasonably expected from him. He was even terrifying in In Bruges, his last foray into comedic territory. At one point, Johnny Depp was slated to play Gustave, but it would definitely be to the film's detriment if Fiennes hadn't been cast in that role. You can immediately imagine how Depp would have played this- his eccentricity has become decidedly one-note through exposure. On the other hand, Fiennes owns the role with a revelatory comic performance, in which his timing impeccably complements the precision with which the rest of the film has been mounted. He also has terrific chemistry with newcomer Tony Revolori as Zero, playing a supportive, but slightly rubbish mentor to his ceaselessly loyal protégé. There are too many actors being too good in this to give mention to everyone, (just look at that poster!) but the other standouts include Willem Dafoe's terrifying thug, (more on whom shortly) Saoirse Ronan's sweet and resourceful love interest, and F. Murray Abraham as the sad, elderly narrator that Zero has become. The film is so busy that Anderson's regular company players, including Bill Murray, Jeff Goldblum, Owen Wilson and Jason Schwartzman, have much smaller roles than you might expect. It's to their credit, and the impressive management of the sprawling story, that they never feel relegated to supporting status- Goldblum's major moment marks the film's most exceptional and memorable setpiece, in which he's stalked by a murderous Dafoe. It's an intense scene that almost feels like it doesn't belong, but ultimately serves to indicate a film that's slightly less gentle than the likes of last year's Moonrise Kingdom. There are more rude words and violence than I can remember in any of his other films, (mind you, I still have to watch Bottle Rocket and Rushmore) but neither are used bluntly. Fiennes' delivery makes poetry out of some decidedly impolite and somewhat inelegant dialogue, and the violence feels entirely in keeping with the established thriller-caper tone. Furthermore, it gets away with having a slightly more melancholy outlook from the older Zero, where most comedy movies wouldn't have bothered- the result is somewhat bittersweet, despite the fact that it's mostly very, very funny. 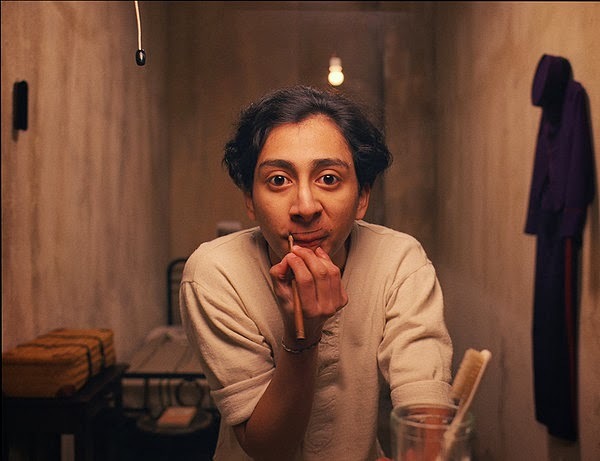 The Grand Budapest Hotel is a vibrant and truly unique concoction, and it's probably one of my favourite Wes Anderson films. The director's style has occasionally got on my wick in the past, but this is a tremendous, purely enjoyable adventure movie. It's quite rightly been compared to material like Tintin and Hitchcock's films for its thriller elements, but the sense of humour is entirely Anderson's own, broaching new territory with the sheer expanse of this pocket world, while still grounding the film in a terrific dynamic between Fiennes and his ward. 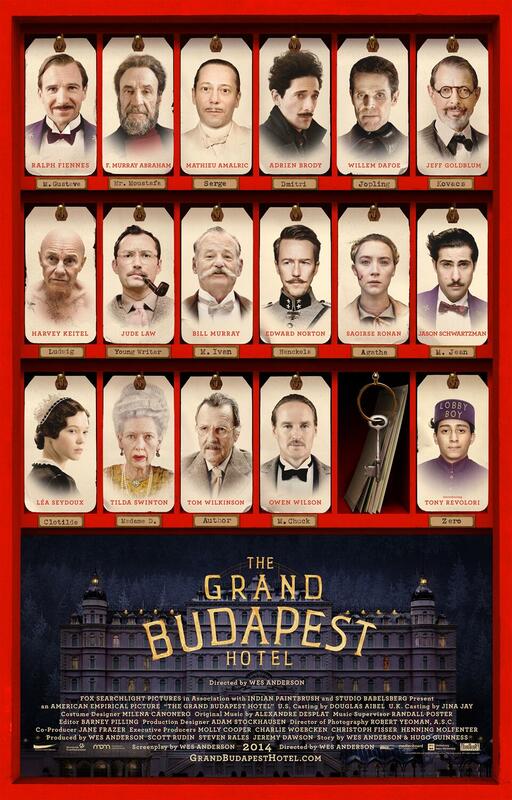 The Grand Budapest Hotel is now showing in cinemas nationwide. If you've seen The Grand Budapest Hotel, why not share your comments below?